These couple of days I've been busy busy making costumes for my boys for their Halloween party at Mom and Tots. Hopefully it will be done by tomorrow! Last week I was going through some stuff (I definitely need to sort things out!) 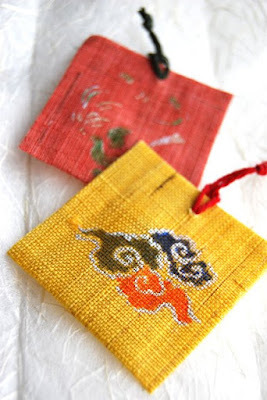 and I came across these beautiful sachets I got from a Japanese student. I can't believe I totally forgot about them. They are stuffed with some kind of potpourri and they smell so wonderful. When I have time I'm going to try to make some of these. Now back to finishing those costumes.